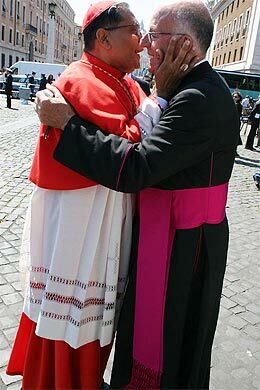 Just so you know, this shot was taken before Cardinal Dias' appointment as the new Red Pope. On a weightier note, if you believe what you hear, we're in the home stretch to the appointment of a new Secretary of State, which could come as early as Friday. These days, anything is possible. And, of course, the meeting of the "New Movements" began this morning with a Mass celebrated at Rocca di Papa by Archbishop Stanislaw Rylko, president of the Pontifical Council for the Laity. The encounter runs through the weekend. Now, as the three main speakers will be Cardinals Christoph Schonborn, Angelo Scola and Marc Ouellet -- all adherents of the Comunione school -- and we have a cieline Pope, don't be surprised to hear the Don Gius playbook emphasized above the others. Again. Again. And again. And that ain't no accident, either. On the papal visit to Auschwitz on Sunday, the images of Cardinal Joachim Meisner of Cologne in tears struck a chord with many people. Only later did I learn that, like many survivors of the camps and their descendants who have no burial spot where they could pay tribute to their deceased loved ones, the remains of the cardinal's father are somewhere in Serbia, in a mass grave. And that, from Poland, Meisner was headed to the Balkans to dedicate the restored Archbishop's Residence in the Serbian capital, Belgrade. As Cologne is one of Europe's -- and the world's -- most fiscally-solvent local churches, it wouldn't be a stretch to believe that the cardinal has supported the small Catholic community there, especially given the personal tie to the place. Knowing that, after Auschwitz, Meisner would be going to Serbia, "where he would love to pray at the grave of his father," one op noted that it was natural for the cardinal to be "a bit emotional." Indeed it would be, and indeed it was. Well, they've finally found a use for Maida Temple (known to many of you as the John Paul II Cultural Center/White Elephant). On June 18, Installation Week in Washington kicks off with a Mass for the whole archdiocese, celebrated by Cardinal Theodore McCarrick in the Basilica of the National Shrine of the Immaculate Conception, in thanksgiving for McCarrick's five and a half year stewardship of the church in the nation's capital. Following the liturgy, a dinner will be held for McCarrick and the priests of the archdiocese in the JPII Center. Four days later, Archbishop-elect Donald Wuerl will be installed in the Basilica, which the archdiocese uses for most of its larger-scale events. Contrary to the usual practice when an installation Mass is held at a venue other than the cathedral of the place, no Vespers service is scheduled for Installation Eve at St Matthew's Cathedral. At said service, when it's employed, the formal act of canonical possession -- the presentation of the papal letter of appointment to the local college of consultors -- ordinarily takes place. So we'll see all this rolled into one on the 22nd. Archbishop Wuerl will celebrate his first Mass at St Matthew's on Sunday, the 25th. The following day, with an archdiocesan pilgrimage, the new archbishop leaves for Rome to receive the pallium from Pope Benedict XVI. So the last word of this Polish sojourn belongs to the cardinal-archbishop of Krakow. The man Benedict XVI referred to on Saturday as "dear Cardinal Stanislaw" made what seemed like a bit of a faux pas at Sunday's liturgy in Blonia Park when he wore his pallium in the presence of the Pope. I recall vividly hearing Stanislaw Dziwisz's voice for the first time. It was completely as I hadn't expected -- a baritone even more resonant than that of his boss of 40 years. "Stentorian" would be a good word for it. What really would've been impressive was if he conceded the rationale, the ancient vestment proper to the archbishop of Krakow, for the Pope to wear. However, given the cut of the Petrine pallium, it would've been a bit cluttered. And if there's one thing the House of Marini line isn't, it's cluttered. Having lobbied for the papal trip, overtaken Warsaw in its scheduling, and having presided over a very successful memorial pilgrimage where the "hope" of canonization was assured, Dziwisz is the winner of the week. So last year, on Memorial Day weekend, the Pope made his first trip outside Rome to the Italian Eucharistic Congress at Bari. And, now, this year, to Poland. Is he trying to crimp our style here in the US or something? Seems like there was a barbeque on the Lot plane heading back. And, lastly, today's visit to Auschwitz (fulltext of B16's message) marked the third occasion in a year on which Cardinal Joachim Meisner of Cologne has shed public tears. This isn't a bad thing -- it's actually quite moving, actually, not to mention refreshing, and the cardinal deserves thanks for reminding all of us how nice it is when a prelate doesn't let his emotions be conditioned out of him along the path of ascent. Despite the delay, maybe Meisner could lend an assist and serve as the gift-bearer. Yes, it'd be a bit belated... but better (four years) late than never. "I Could Not Fail To Come Here"
Having capped a successful pilgrimage to his predecessor's homeland, the Pope is on his way back to Rome. In the most-anticipated moment of his journey to Poland, just before departing Benedict XVI issued a strong and moving message on visiting the most infamous concentration camps of the German occupation of Poland, Auschwitz and Birkenau. Last night, in a particularly moving moment, the successor to Karol Wojtyla appeared at the window of the Archbishop's Residence in Krakow, the vantage from which Wojtyla communicated with his flock in his pre-papal days, and then through the night on his homecoming pilgrimages as Pope. A shadow was cast over the Auschwitz visit by an attack Saturday on Poland's chief rabbi, Michael Schudrich. Police said Schudrich was unhurt and the assailant fled, and that they were treating it as a possible anti-Semitic attack. Today we heard the words of Jesus: "You shall receive power when the Holy Spirit has come upon you; and you shall be my witnesses in Jerusalem and in all Judaea and Samaria, and to the end of the earth" (Acts 1:8). Centuries ago these words reached Poland. They challenged, and continue to challenge all those who say they belong to Christ, who consider his to be the greatest cause. We need to be witnesses of Jesus, who lives in the Church and in human hearts. He has given us a mission. On the day he ascended to heaven, he said to his Apostles: "Go into all the world and preach the Gospel to the whole creation … And they went forth and preached everywhere, while the Lord worked with them and confirmed the message by the signs that attended it" (Mk 16:15,20). Dear brothers and sisters! When Karol Wojtyła was elected to the See of Peter in order to serve the universal Church, your land became a place of special witness to faith in Jesus Christ. You were called to give this witness before the whole world. This vocation of yours is always needed, and it is perhaps even more urgent than ever, now that the Servant of God has passed from this life. Do not deprive the world of this witness! Before I return to Rome to continue my ministry, I appeal to all of you in the words spoken here by Pope John Paul II in 1979: "You must be strong, dear brothers and sisters. You must be strong with the strength that comes from faith. You must be strong with the strength of faith. You must be faithful. Today, more than in any other age, you need this strength. You must be strong with the strength of hope, the hope that brings perfect joy in life and which prevents us from ever grieving the Holy Spirit! You must be strong with love, the love which is stronger than death ... You must be strong with the strength of faith, hope and charity, a charity that is conscious, mature and responsible, and which can help us at this moment of our history to carry on the great dialogue with man and the world, a dialogue rooted in dialogue with God himself, with the Father, through the Son in the Holy Spirit, the dialogue of salvation" (Homily, 10 June 1979, no. 4). I too, Benedict XVI, the Successor of Pope John Paul II, am asking you to look up from earth to heaven, to lift your eyes to the One to whom succeeding generations have looked for two thousand years, and in whom they have discovered life’s ultimate meaning. Strengthened by faith in God, devote yourselves fervently to consolidating his Kingdom on earth, a Kingdom of goodness, justice, solidarity and mercy. I ask you to bear courageous witness to the Gospel before today’s world, bringing hope to the poor, the suffering, the lost and abandoned, the desperate and those yearning for freedom, truth and peace. By doing good to your neighbour and showing your concern for the common good, you bear witness that God is love. I ask you, finally, to share with the other peoples of Europe and the world the treasure of your faith, not least as a way of honouring the memory of your countryman, who, as the Successor of Saint Peter, did this with extraordinary power and effectiveness. And remember me in your prayers and sacrifices, even as you remembered my great Predecessor, so that I can carry out the mission Christ has given me. I ask you to stand firm in your faith! Stand firm in your hope! Stand firm in your love! Amen! 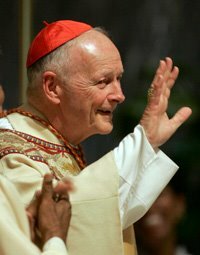 "Loving God and Loving the Little Guy"
Yesterday, as many of you won't enjoy admitting, Cardinal Theodore McCarrick ordained 12 priests for the archdiocese of Washington, its largest class since 1973. As the Washington Post highlights today, four of the District's new clerics were mentored by a priest who was murdered in 2000. Before an overflow crowd of about 2,700, the Wells guys were among a dozen men who became Catholic priests at a solemn yet joy-filled ceremony at the Basilica of the National Shrine of the Immaculate Conception in Northeast Washington. Four had worked with Wells at Our Lady of Lourdes Church in Bethesda, and one met him at a parish in Bowie. "It's so rare to see this many from one place," said the Rev. 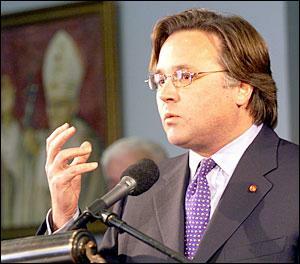 Edward Burns, who heads the office of vocations for the U.S. Conference of Catholic Bishops. "It just shows the impact one priest can have." Not to be outdone, McCarrick -- currently Washington's apostolic administrator until the 22 June installation of Archbishop-elect Donald Wuerl -- gave the commencement address last week at Stonehill College, a suburban Boston school run by the Congregation of the Holy Cross. Gratefully, the college has posted the text of the cardinal's address. It's Vintage Ted: the Truths of faith couched in the lure of humor, contagious affability, and a resonant, uplifting message. Pray with me for a minute, just informally, that I say something important because the most important thing is that I say something that should be useful to you on this very special day in your lives -- a very special day in your lives; but, even more, a special day in the lives of your parents because they look at this day as an extraordinary accomplishment for the whole family. And, I think they take, if it’s possible, more joy and more pride in this day and in what you’ve done than even you do. So, I tell them how proud I am of them too because of what they have managed to do in helping you reach this very special moment in your own life. I want to share with you the secret of happiness, that’s why I’m here. I will do that by first talking about a cartoon. I’m a big cartoon person. They say the Irish when they open the newspaper, they first look at the obituaries. When I open the newspaper, I first look at the cartoons because often they are the only things I really understand. On the next frame, you see him going down with a real quizzical look on his face. He’s going down, going down, going down. In the last frame, he looks right at us and he says, “It’s really got to be more than just buy low and sell high.” And, it is, and it is. The secret of happiness is to love each other and to love God, that’s it. No, I’m not going to sit down right now. But, that’s the secret of happiness. Coming the weekend after the Holy See's announcement on Marcial Maciel, the meditation on Fr Basil Moreau, the founder of the CSCs who "was a great builder, he was a great visionary, and he died as an outcast... divorced from his Congregation and died in terrible poverty and in disgrace" is notable for the confluence of timing. Earlier today, while visiting the Marian shrine at Kalwaria so dear to his predecessor, Benedict XVI offered his "hope [that] Divine Providence will soon concede the Beatification and Canonisation of our beloved Pope John Paul II." The impromptu remark was delivered under the watchful eye of Cardinal Stanislaw Dziwisz of Krakow, who served Karol Wojtyla as private secretary for four decades and has devoted himself to ensuring the canonization of his boss. Notably, the Pope referred to Dziwisz not by his last name, but -- in an echo of his Roman nickname -- called him "Cardinal Stanislaw." Today the pontiff also visited the parish church of Wadowice, where Karol Wojtyla was baptized, and the Shrine of the Divine Mercy in Krakow, where a large group of the sick and the suffering. "Through you and through your suffering," Benedict said at the Mercy Shrine, "he bows down towards humanity with love. You who say in silence: 'Jesus, I trust in you' teach us that there is no faith more profound, no hope more alive and no love more ardent than the faith, hope and love of a person who in the midst of suffering places himself securely in God’s hands. May the human hands of those who care for you in the name of mercy be an extension of the open hands of God. "I would so willingly embrace each one of you," the Pope concluded. "But since this is impossible, I draw you spiritually to my heart." I had gotten a bit of feed about this some weeks ago, but it's made today's edition of The Tablet: Archbishop Roberto Gonzalez of San Juan picked up plaudits a couple weeks back as he played broker in bringing together Puerto Rico's political leaders to halt a government shutdown. Word from the island is that, in public opinion surveys, the New Jersey-born archbishop -- a former auxiliary of Boston and bishop of Corpus Christi -- polls higher than that of any of its political class, a feat accomplished on the mainland by Cardinal McCarrick and... Cardinal McCarrick. Along with the leaders of the island’s main evangelical and Pentecostal Churches, he chaired a mediation committee that brought together Governor Aníbal Acevedo Vilá and opposition leaders to agree on raising an emergency loan of more than US$700m (£370m). 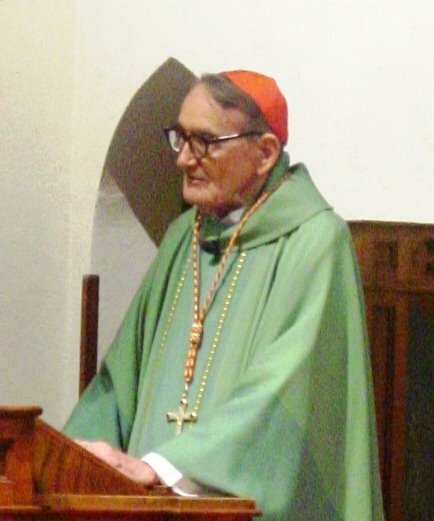 Archbishop González Nieves explained that he saw it as the Church’s duty to intervene in economic, social or political crises when the stability of the country was under threat. “Our action is predicated on the need to protect the dignity of the individual, the right to work, health and peace,” he told the San Juan daily El Nuevo Día this week. The crisis arose when the government of the Caribbean island, which is a semi-autonomous territory of the United States, was unable to persuade the opposition-dominated legislature to approve a tax package designed to plug a gap in this year’s budget. The recent spate of O'Malleyization in Boston has hit a stumbling block. Last night marked the first night of a previously-planned Ascension-to-Pentecost novena of liturgies at which Cardinal Sean O'Malley and the clergy of the archdiocese would express remorse over the abuse revelations there. At Holy Cross Cathedral, O'Malley and the clergy in attendance prostrated themselves as a litany of repentance was sung, and the cardinal renounced his cathedra for the front pew as a victim-survivor took the pulpit. It would've been top news, and further impetus for good will for the beleagured local church and its embattled head. However, this week's revelations of sexual harassment by the head of the archdiocesan health system and his subsequent ouster have overtaken the pages. The contretemps over O'Malley's initial decision to reprimand but not fire the president of the Caritas Christi Health Care System after multiple allegations of sexual harassment is the latest in a series of controversies that have severely damaged O'Malley's reputation as a healer and fixer of troubled dioceses, and now some prominent Catholics are wondering whether the Franciscan Capuchin friar has the administrative skills and decisive temperament to oversee the complex and troubled Archdiocese of Boston. 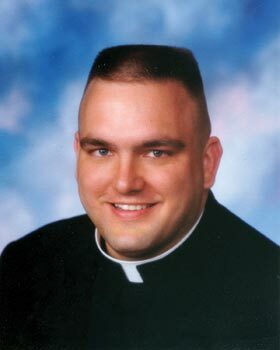 Everyone 'round these parts is more than just a little stunned at news of the sudden and tragic death of Fr Todd Reitmeyer, a priest of Sioux Falls killed yesterday in a jetski accident while on vacation with his family in Austin. Ordained in 2003, Fr Todd was one of the "father-bloggers," and his site has been for many a place of encouragement and solace as readers journeyed with him through his ministry; his most recent assignment has been as administrator of three parishes in the sprawling South Dakota diocese. You'll forgive me for being shaken up -- I just heard from him two days back. On writing about the episcopal vacancies to be filled, I had forgotten to list Sioux Falls, and Reitmeyer joked that "being such a small diocese, we're used to" being overlooked. In our correspondence, his eagerness for the coming of Sioux Falls' new bishop was clear. As the diocese has been waiting 17 months since Bishop Robert Carlson's appointment to Saginaw, Fr Todd hoped that the appointment would be soon. To use his quote on the topic, "I hate living without a Bishop." Fr Todd will be buried at home in Texas, with his mentor Carlson presiding. I have prayed far too many Offices of and other prayers for the Dead this year, and I've lost at least five readers to life eternal just in these last few weeks. But that sorrow comes with the territory of being part of a community, of a communion, even one where people just know each other through e.mails and posts or, even more simply, through prayer. and to share the joys and burdens of their lives. the fullness of life you promised to those who preach your holy Gospel. May Fr Todd enjoy the company of the angels and -- in these days, the difficulty of which is almost impossible to imagine -- may his family and many friends and admirers be gifted with abundant consolation and peace. 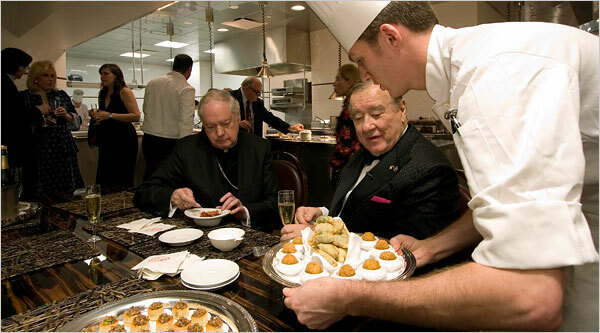 You've gotta love the photo -- Cardinal Edward Egan of New York and the legendary Sirio Maccioni at the opening of "Le Cirque 3.0," the third "incarnation" of the institution long viewed as the city's premier restaurant. Before moving to its new digs on East 58th its predecessor was, of course, Le Cirque 2000, where Cardinal Sodano could usually be found on his trips to Manhattan. Last week, Egan ordained eight priests in St Patrick's Cathedral. Two nights later, he conferred his first batch of papal honors on the New York clergy when 38 new monsignori -- led by the the Cathedral's new rector, now Mons. Robert Ritchie -- picked up their rescripts in another St Pat's ceremony. As the cardinal nears his sixth anniversary at the helm of Big Apple Catholicism, plans have started to be announced for the bicentennial of the archdiocese's founding in 2008 (none of the other Sees celebrating 200 years have done a damn thing yet), his parish reconfiguration plan is getting a much smoother reception than anticipated and -- lest anyone forget -- there's the not-so-little matter of the church's breakout into satellite radio when "The Catholic Channel" debuts in the fall on Sirius. After a couple bumps along the road -- and, it must be said, less than a year off his 75th birthday -- it seems that for the current occupant of 452 Madison, life is good right now. But the work's still getting done, too. Suffice it to say, it looks like a healthy balance. In light of his retirement last week as archbishop of Washington, today's Catholic Standard in the capital carries the news that Cardinal Theodore McCarrick "has decided to stop writing his weekly 'Thinking of You' column" for the archdiocesan paper. It's the end of an era -- and with it goes another precious bit of what little hierarchical sanity we have in these strange days. However, and luckily, we've still got the column's archives going back to 2002... And maybe, if we're lucky, the Ted'll pen a book in his retirement. What a gift that'd be. And just in case it happens, I've already cleared a place for it on my shelves -- right next to Thomas à Kempis. "What's 'Che Gioia' in Polish?" So, yes, the John Paul II Memorial Pilgrimage has begun. Benedict XVI -- who, for some strange reason, has been wearing the ermine mozzetta and lace rochet all day long -- is currently greeting civil dignitaries after paying a courtesy visit on Polish President Lech Kaczynski at his residence. Following a speech on his arrival at Warsaw Airport praising his amato predecessor -- whom the Holy See Press Office this morning referred to as Benedict's "Venerated Predecessor the Servant of God John Paul II" -- the day's major talk was at the capital's St John Cathedral, where he addressed a large gathering of priests and bishops. Here's a snip from the Cathedral. Readers of "A New Song for the Lord" will recognize some of the concepts at work. The faithful expect only one thing from priests: that they be specialists in promoting the encounter between man and God. The priest is not asked to be an expert in economics, construction or politics. He is expected to be an expert in the spiritual life. With this end in view, when a young priest takes his first steps, he needs to be able to refer to an experienced teacher who will help him not to lose his way among the many ideas put forward by the culture of the moment. In the face of the temptations of relativism or the permissive society, there is absolutely no need for the priest to know all the latest, changing currents of thought; what the faithful expect from him is that he be a witness to the eternal wisdom contained in the revealed word. Solicitude for the quality of personal prayer and for good theological formation bear fruit in life. Living under the influence of totalitarianism may have given rise to an unconscious tendency to hide under an external mask, and in consequence to become somewhat hypocritical. Clearly this does not promote authentic fraternal relations and may lead to an exaggerated concentration on oneself. In reality, we grow in affective maturity when our hearts adhere to God. Christ needs priests who are mature, virile, capable of cultivating an authentic spiritual paternity. For this to happen, priests need to be honest with themselves, open with their spiritual director and trusting in divine mercy. Stand firm in your faith! To you too I entrust this motto of my pilgrimage. Be authentic in your life and your ministry. Gazing upon Christ, live a modest life, in solidarity with the faithful to whom you have been sent. Serve everyone; be accessible in the parishes and in the confessionals, accompany the new movements and associations, support families, do not forget the link with young people, remember the poor and the abandoned. If you live by faith, the Holy Spirit will suggest to you what you must say and how you must serve. You will always be able to count on the help of her who goes before the Church in faith. I exhort you to call upon her always in words that you know well: "We are close to you, we remember you, we watch." A Win For the "Soul Patrol"
America, meet your new Idol.... Well, that's if the majority of 63.4 million votes are to be believed. It's official -- American Idol has surpassed Catholicism as the US' dominant religion. As many of you (hopefully) saw, at the top of the hour 28 year-old Alabama native Taylor Hicks -- aka "Gray Charles," Commandant of the "Soul Patrol," etc. -- won the annual competition which has become TV's behemoth. Held in the room built to host the Academy Awards, the Idol finale seems to have overtaken even the Oscars themselves. Populist triumph or harbinger of the Apocalypse? You decide. I'll admit -- I sent a text message vote in (...or two... or ten) for Kat McPhee, seeing her as the heir apparent to Kelly Clarkson, who, as veteran readers know, is my flavor. Oh well, seems that consummating the McPheever wasn't her destiny. And has anyone figured out how it is that, after Clarkson, the best-remembered AI contestant is William Hung? Just so you all know, props are out there to anyone who's able to work -- or already has worked -- Idol into the context of a homily. Talk about a surefire way to get people's attention and lead them to something even bigger than an overproduced, fleeting reality extravaganza. If the Idol idea hasn't crossed the minds of our preachers, take a swing at it. Chances are, it'll pay off. As some readers wanted to come at me with pickaxes when I wrote about the liturgical celebration of New Year in the neighborhood where I was raised, I'm curious what you'll all make of this. In that photo is Cardinal Norberto Rivera of Mexico City. In his hand is what we Yanks call a soccer ball. And the men in suits are Mexico's national soccer team, who leave on Saturday for the World Cup, which begins shortly in Germany. Apparently, la nacion -- the people who gave us the most beautiful cultural-liturgical manifestation of all time with the 12 December mananitas -- showed up en masse at Mama Guadalupe's house to pray -- for victory, apparently. Legions of fans -- some sporting game regalia like clown costumes and Mexican flag-capes -- packed the Basilica of Our Lady of Guadalupe in Mexico City to attend a special Mass for the "Tri," as the team is affectionately called in Mexico. "As Mexicans we are joyful and supportive of our brothers who will be representing our country," Mexico City Cardinal Norberto Rivera Carrera said during the May 20 Mass. A crowd of thousands ran alongside the team bus as it made its way down the boulevard bound for the airport. Those words -- taken from the first letter of Paul to Timothy -- mean "I know him in whom I have believed." Dulles' story is a well-known one -- the scion of a blue-blood political dynasty who entered the church in his late 20s, became a Jesuit, launched into a prolific service as a theologian, authoring over 750 articles and 22 books and was honored as no prior American priest had been when John Paul II elevated him to the College of Cardinals at the 2001 consistory. However, the emblematic sign of Dulles' commitment and love for the church he's made his own is one which has been manifested not before his red hat, but since. It would've been quite easy and universally understood if the octogenarian marvel -- who'll mark his 88th birthday in August -- chose to rest on his laurels and enjoy the quiet life. But, if anything, the cardinal has only increased his amount of engagement, teaching and service since his elevation, so much so that those half his age who've tried to keep up with him in the process will tell you that, even now, it is no easy task. As all the obligations he takes on aren't rooted in the duties of another post, but simply out of the love of his craft and an eagerness to share his wisdom where it's sought, it's no stretch to call this "prelate without portfolio" the hardest-working American cardinal. A flood of well-wishers headed up by three other cardinals will join Dulles for tomorrow's liturgy and a fund-raising dinner for Fordham. 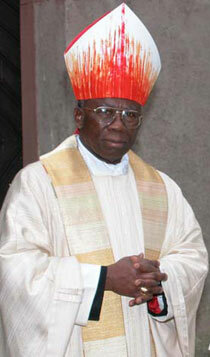 As he marks this great milestone, many congratulations, thanks and happy returns to His Eminence. So next weekend, this year's docket of four weddings -- and, please God, no funerals -- kicks off. As many of you might've heard, even for the diaspora here in the States, an Italian wedding isn't a one day affair, but one with months' worth of preludes and parties in the run-up. And -- at least, in the old neighborhood -- Wedding Week traditionally kicks off with the Bridal Serenade. I could write a book-length chapter on it, but in a nutshell the "family" (not simply blood relations, mind you, but long-moved away neighbors, childhood classmates, the local clergy... basically, everyone you've ever known who's still alive) congregates, usually at the "suitably" (i.e. garishly) decorated home of the bride's parents, where an open-house is prepared, complete with home-cooked, buffet-style extravaganza meal. Not to mention lots of booze. The whole block on which the house is located is usually closed off as the revelers spill into the street, and it's not unknown that a couple tents are brought in to shelter the overflow. A DJ is stationed by the front door, and it's hour after hour of eating, dancing in the streets and catching up with people you haven't seen in ages and you won't see again until the next iteration of these things. More often than not, once everyone's in the proper disposition, an accordion is brought out. The night reaches its climax when a 30-foot ladder is brought out and the bride-to-be appears at the upstairs window. The groom climbs the ladder, wireless mic in hand (knowing my cousin, he'll find some way to bring the accordion up, too), and the DJ spins the instrumental track to three or four sappy love songs, which the groom sings. I've been tapped to read at the Nuptial Mass -- which I've basically planned -- and am reminded that I have to write the intercessions, and call to get the names of the deceased they want mentioned.... For the first time in a decade, I'll be returning to the ambo where my lectoring days began. After doing it practically weekly all through middle school, high school and college, I haven't proclaimed a reading in public in a long time. I'd love to return to it on a regular basis, as it's such a charge. But oh well. Lastly, a word to our clergy-readers: I don't know how you lot deal with some of these Bridezillas out there, who treat their Big Day as if it's nothing less than the zero hour of salvation history. Fortunately, my cousin's intended next week isn't one of the sort but, suffice it to say, I've seen some real craziness in my time, so much so it makes neo-Tridentines look relatively sedate. Again, I don't know how you guys do it, but God love you for your patience and fortitude. Some of you may remember the story last week about the priest in the diocese of Bridgeport -- i.e. Fairfield County, Connecticut, the richest place in America -- who took the trap-door exit after a private investigator that he bilked his parish in excess of $200,000 on expenses for his, er, lifestyle... with another man. Well, it gets better... Worse, actually. But you get the idea. A priest hired to replace a pastor accused of using church money to pay for a lavish lifestyle with another man has resigned, admitting he was the one who hired a private investigator to look into the pastor. Madden admitted Tuesday that he and the parish bookkeeper hired the private investigator with their own money even while working with the diocese in connection with its own probe of Fay. "I'm sorry Father Jude did what he did," Madden told parishioners Tuesday, according to a copy of his remarks obtained by The Associated Press. "I'm sorry that the accountant and the finance board were asleep at the switch. And I am sorry and angry that the diocese failed to come to my rescue when there were red flags waving everywhere." Madden called the past four years "a living hell" for him. He said the diocese is "ripping mad" at him and the bookkeeper "for what we saw as a prudent effort to protect ourselves." "I don't know what is going to happen to me now, but whatever it is, it will be a welcome relief from the extreme physical and emotional strain I have been suffering," Madden said. "I simply could not stand behind that altar and look out at you good people, knowing what was being done to you." Suffice it to say -- as if it wasn't enough being Chairman of the CUA Board, Supreme Chaplain of the Knights of Columbus and (not to be outdone) Chair of the USCCB Committee for Doctrine and Pastoral Practices -- Lori's got his hands full these days. The Pharaoh's onetime consigliere has become a Pharaoh in his own right. As buzzed here yesterday, the Philadelphia Media Holdings team led by former DEFCON 1 archdiocesan media operative Brian Tierney (left) has inked a deal to purchase the city's Inquirer and Daily News from McClatchy for the tidy sum of $562 million. If you need an indicator of Tierney's background, just look over his shoulder at the portrait in the background.... Same photo's being used in the Inky's story. Press conference expected shortly. The deal will return The Inquirer and Philadelphia Daily News to local private ownership for the first time since since Walter H. Annenberg sold the papers to Knight Newspapers Inc. in 1969. "I sincerely hope it will be a good deal for the papers," McClatchy chairman Gary Pruitt said in an interview. "I understand the concerns. I think it will be a good outcome." In a statement he called it a "win-win deal" for McClatchy, the buyers and Philadelphia. He called it a "full, fair price." Local ownership by a group with diversified business and political interests could cast the papers' editorial independence into doubt, some observers have worried. The deal included $515 million in cash and $47 million in assumed pension liabilities. Congrats to the new owners, my dad's new bosses.... After nine months of anxiety, the old man is breathing a sigh of relief. To know that feels so good. And, almost as good, God's favorite newspaper lives! It didn't take rocket science to figure out that it was never really about the harrassment charges, the investigation, the SVP for human resources, etc. etc. etc. [I]n a reflection of simmering tensions within the archdiocese, Bishop Richard G. Lennon, who was O'Malley's vicar general until he became bishop of Cleveland last week, issued a statement saying that O'Malley removed him from two joint Caritas boards just hours before last Thursday's vote. Lennon, according to several people he has talked to, had strongly urged that Haddad be dismissed, and would have made that argument to the governing board. The archdiocese contradicted Lennon's account. Thank you. That's all we need to know -- i.e. now that he's not running that curia anymore, Lennon is taking arms against it from afar. Word from Boston is that Mike Barnacle is exploding on-air, going bonzo about how, even when the bishop of Cleveland is now supposed to be gone from the local scene, he isn't. Ergo, par for the course. A fortnight ago, the National Catholic Reporter devoted its cover story to an unfortunate but predictable hatchet-piece on its hometown bishop, Robert Finn of Kansas City-St Joseph. Suffice it to say, the piece was more a paean to NCR's ecclesiology of choice than a constructive contribution to the future and the good of the local church in which it's based. Well, if the Reporter wasn't happy then, this week's Catholic Key will have them jumping out of windows. In addition to ordaining a transitional deacon at the Benedictines' Conception Abbey, located in the diocese, Bishop Finn welcomed a new Benedictine community to KCSJ: the sisters of Mary, Queen of the Apostles, who marked their move to northwest Missouri (at Finn's invitation) with the vesting of a new member. When Communion was finished, Bishop Finn presided over ceremonies clothing Sister Greta with the habit of the Benedictines of Mary, Queen of Apostles. Sister Greta, the novice-to-be, dressed as a bride, approached the altar, accompanied by two older sisters. Following prayer, Sister Greta's wedding veil was removed and the bishop cut her hair. 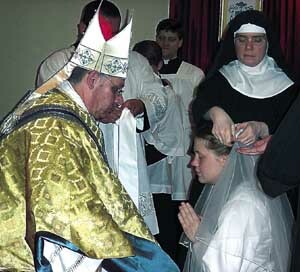 After she changed from her wedding gown to her tunic, Bishop Finn presented Sr. Greta with her cincture, her scapular (the monastic garment that rests on the shoulders), her veil and a candle. Sister Greta became Sister Misericordia, Latin for "mercy." Her smile at that moment was brighter than any ray of sunshine. And so, the church in KC continues on, diversifies, flourishes -- call it what you will.... If only NCR might share the journey and, so, accomplish the same. You know, the funny things never cease. Keeping an eye on the numbers earlier today, I noted an inordinate number of visitors who dropped in by Googling the term "Sopranos recap." This was probably as I'd written about the show tangentially a few weeks back. So if you're popping in to find out what happened last night (and because you don't have OnDemand or TiVo), no dice. Sorry, but HBO would sue the pants off me. On second thought, if you scroll down to the next photo below, you'll find something in the shot which looks like it came from a motel room in Fort Lee. But that's all I'm sayin'. First, the clock hadn't struck 8am yesterday when the following message arrived from Boston: "All hell is breaking loose at Caritas Christi Health Care." A sexual-harrassment case involving the provider's president was splashed on the front page of the Globe, where it continues today. Cardinal Sean O'Malley issued a "stern reprimand," the head of Caritas' HR didn't like that and went to the press -- despite the board's voting to back the sanction and nothing more. Not pretty and, so I'm told, a bit more complex than meets the eye. Second, this might be a rerun, but if you haven't heard it, then it's new to you: the Pope's Latinist -- Reggie Foster, OCD -- on the translation of Benedict XVI's first encyclical Deus caritas est. (Link opens as RealAudio.) Foster always makes good copy, as they say, but this is the great one in especially rare form. Money quote: "And I told the students the other day -- we were reading St. Augustine -- they were almost in tears over St. Augustine, it's so beautiful. I said 'Well, you have nothing to say. Just translate St. Augustine in the pulpit, and sit down, AND SHUT UP!'" Third, it was a thrill to spend a chunk of Saturday with Bill McGarvey, rockstar/editor in chief of Busted Halo, as he made a triumphant return trip to his native city. In a church which seems ever more internecine and inaccessible to the wider world in its discussions amongst its members, BH -- an apostolate of the Paulists -- serves as a much-needed reminder of why the church exists, and how far the biz often finds itself from its true mission in our times. In case you already haven't, do check it out. And, finally, last call for the "words of wisdom" to the newly-ordained. I'm running behind on everything... All apologies. Doesn't help that I'm a bit stuffed up with a head cold and that the machine I've had for four months (the readership's gift) is already crashing left and right, programs aren't opening, and I've had to restore my files four times in the last week. I might need Reggie to perform an exorcism on this thing. In the meantime, word to the wise: don't buy a Dell. And, suffice it to say, as the exigencies allow, I'm converting to the cult of Apple. Thanks to Todd for picking up last night's post. As he's an actual liturgist and always tries to find some balance in the chaos, you might find his insights more than just worthwhile. The way it looks now, it seems that the episcopal conferences -- i.e. those with reservations -- are being pressured to vote "yes," so as to avert disquiet in their obsequience to the Holy See. To "sweeten" the deal, the assurance is that, so long as they affirm the new translations, all concerns will be vouchsafed after the votes are in. Within a year, the new translations will be implemented. As the vote will be a fait accompli by the time it's taken, my mind's already trying to figure out where the best place will be to show up on the first Sunday of their use. Of course, on that morning, when the serene and kindly gaze of the Almighty will be resplendent with vivaciousness, celebrants everywhere will be impinged to play schoolmarm and utter something to the effect of, "Starting today, the church commands that when I say 'The Lord be with you,' you reply, 'And with your spirit.' Let's try that now...."
And then, when the people keep replying, "And also with you," some will ride with it. Others, however, will have a conniption. I'm strategizing where I'll find the biggest conniption. And when I figure it out, I'll be there, watching from the cry room -- shedding tears not from sorrow, but sheer hysterics. Well, it's Sunday, and you know what that means: B16. Window. Regina Caeli. Translation. The book of the Acts of the Apostles tells us that Jesus, after his resurrection, appeared to the disciples for forty days and then "was taken up on high before their eyes" (1:9). It is the Ascension, which feast we celebrate on Thursday 25 May, although in some countries it's transferred to the following Sunday. The significance of this final act of Christ is a twofold one. Above all, by ascending "on high," he reveals in an unequivocal way his divinity: he returns to where he came from, in God, after having completed his mission on earth. Additionally, Christ ascends to heaven with the humanity which he took on and resurrected from the dead: this humanity is our own, transfigured, made divine, become eternal. The Ascension, therefore, reveals the "highest vocation" (Gaudium et spes, 22) of each human person: that he is called to eternal life in the Kingdom of God, the Kingdom of love, of light and of peace. On the feast of the Ascension we celebrate the World Day of Social Communications, sought by the Second Vatican Council and now in its 40th year. This year has for its theme: "The Media: Net of Communication, Communion and Cooperation." The Church watches the media with attention, as it represents an important vehicle to spread the Gospel and to further the solidarity among peoples, to turn its attention toward the great problems which profoundly plague them. Today, as an example, with the "World March to Fight Hunger" (Walk the World) initiative, announced by the World Food Program of the United Nations, is intended to increase awareness among governments and public opinion on the necessity of concrete and timely action to guarantee to all, in particular to children, "freedom from hunger." I'm close in prayer to this event, which is taking place in Rome and in cities in around 100 other countries. I wish deeply that, thanks to the contribution of all, we may overcome the scourge of hunger which afflicts humanity, placing at serious risk the hope of life of millions of people. I'm thinking, in the first place, of the urgent and dramatic situation of the Darfur, in the Sudan, where great difficulties persist in satisfying even the primary nourishment needs of the population. With the customary recitation of the Regina Caeli we particularly entrust today to the Virgin Mary our brothers oppressed by the scourges of hunger, that many may come to their aid and all those who operate means of social communication contribute to resolidifying among peoples the bonds of solidarity and peace. We also ask Our Lady to make fruitful the apostolic voyage to Poland which, please God, I will undertake from Thursday to next Sunday in memory of the beloved John Paul II. In today's edition of Il Messaggero, Orazio Petrosillo -- the paper's resident Vaticanista who sounded the warning siren on the Sepe appointment to Naples two weeks back -- says that, in the mind of Benedict XVI "The true reform of the Curia... won't be made up of the waltz of appointments and the makeup of the dicasteries, but in a slow purificaion of faith, at the risk of giving the impression of inactivity." At the same time, however, we're told to expect the appointment of a new Secretary of State on the 10th of June, if not the preceding Saturday. And that the retirement of Angelo Sodano will set off a "domino effect" of appointments across the church's central administrative structure. The Pope made the front pages of the big dailies today, not for the Sepe move, but a speech given yesterday to Spain's new ambassador to the Holy See, Francisco Vazquez Vazquez, in which he said that "the family must not be supplanted or obfuscated" by other constructs which would wish to diminish it. "The Church proclaims without reserve the primordial right to life," Benedict said, "from its conception until its natural end, the right to be born, to form and live in a family." Some weeks ago, you all were advised to expect the first major throes of Benedict XVI's curial reshuffle before the Pope's departure for Poland on the 25th. Well, right on time and just as predicted for about a year, this morning the Holy See announced that Cardinal Crescenzio Sepe, heretofore prefect of the Congregation for the Evangelization of Peoples, has been appointed archbishop of Naples in succession to the retiring Cardinal Michele Giordano. To succeed Sepe, the long-standing buzz was also confirmed: the new Red Pope is Cardinal Ivan Dias, the veteran of Vatican diplomacy who has served as archbishop of Bombay since 1996. Dias, shown at left, turned 70 last month. He was elevated to the College at the mega-consistory of 2001. While secretaries of congregations have often been sent from Rome to archdioceses of their own in the recent past, today's move is the first time in memory that a cardinal-prefect has been exiled from the Curia. In tandem with Sri Lankan Archbishop Malcolm Ranjith, secretary for the Congregation of Divine Worship, the selection of Dias to head the Propaganda Fide is the second of Benedict XVI's three major dicasterial appointees to date to have been called from the Indian subcontinent. For those interested in the people and personalities who make up the court of Benedict XVI, the current Vanity Fair contains a very notable profile on Princess Gloria von Thurn und Taxis. Many of you love TNT, as she's affectionately known, for her Christmas gift of the ermine mozzetta and camauro to her longtime friend, now Pope. The even-more-legendary blue tracksuits, too, are said to be her doing. "[Ratzinger] understood that the Second Vatican Council had gone too far, and that now we had a happy-clappy situation with guitars and drums and people gathering around the altar and yelling. The cardinal felt that people who believed in the old traditions needed to have an existence in the Church, too." Coming from someone who probably knows what Ratzi thinks better than his own Congregation for Divine Worship and the Discipline of the Sacraments, it makes for a very. interesting. statement. From experience, I can tell you there's no better place in journalism to begin a career than the august Philadelphia Daily News. Anyways, in keeping with the DN's grand tradition, here's a snip from the paper's DaVinci Code review, written by its movie critic Gary Thompson. And, by the by, the movie gets panned. First, as a non-Catholic, let me say the notion of Christ's being married does not offend me. Part of the appeal of Jesus is that he was sent to earth to feel our pain, to be just as miserable as the rest of us. What better way than being married? What did offend me was the idea that the real legacy of Christ, who blessed the poor and meek, evicted the money changers and told Caesar to bugger off, was as sire to a monarchy, another tiresome European aristocracy: a "royal bloodline" whose members can marry tennis players, get DWI citiations and end up on Page Six. There are those who found the bloody Christ of Mel Gibson's "Passion" hard to take. I prefer the bloody to the bluebloody. Following this morning's statement of the Holy See, the Legionaries of Christ have released a response to the judgment against their founder, Marcial Maciel. Yet again, the community likens its founder to Jesus Christ, views the Vatican's directive to "a new cross that God... has allowed [Maciel] to suffer," and implies that the founder -- who must now live out a restricted ministry of prayer and penance -- will continue to be referred in-house as "Padre Nuestro." 1. Fr. Marcial Maciel has received during his life a great number of accusations. In the last few years, some of these were presented to the Holy See so that a canonical process would be opened. 2. Facing the accusations made against him, he declared his innocence and, following the example of Jesus Christ, decided not to defend himself in any way. 3. Considering his advanced age and his frail health, the Holy See has decided not to begin a canonical process but to "invite him to a reserved life of prayer and penance, renouncing to any public ministry". 4. Fr. Maciel, with the spirit of obedience to the Church that has always characterized him, he has accepted this communiqué with faith, complete serenity and tranquility of conscience, knowing that it is a new cross that God, the Father of Mercy, has allowed him to suffer and that will obtain many graces for the Legion of Christ and the Regnum Christi Movement. 5. The Legionaries of Christ and the members of the Regnum Christi, following the example of Fr. Maciel and united to him, accept and will accept always the directives of the Holy See with profound spirit of obedience and faith. We renew our commitment to work with great intensity to live our charism of charity and extend the Kingdom of Christ serving the Church. It's Friday again, so that means the weekly rollout of the World's Best Catholic Paper. Powerful editorial on the Code, on this, its day of release. And a cover piece on Mary Magdalene with this goodie: "Beyond the myth of her ‘bloodline’ is the real debate that as the first witness to the risen Christ she could have a better claim as founder of the Church than Paul himself...."
From the humble US correspondent, a brief on the aforementioned (but still very exciting) Sirius deal which'll bring the New York archdiocese's envisioned "Catholic Channel" to the satellite airwaves, starting in the fall.